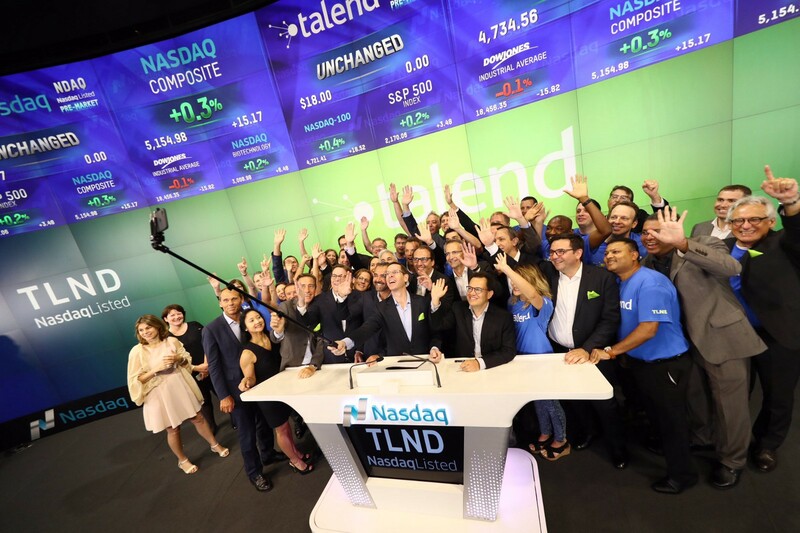 On 29th July, Talend listed on NASDAQ. Talend, a data management software company started in Paris in 2006 by two brilliant French co-founders, Bertrand Diard and Fabrice Bonan, and now headquartered in California, has become one of the very few technology companies from France to list on the US exchange. As Chairman of the company, and investor with Balderton, I was fortunate to share the stage with the team for the bell ceremony on Nasdaq. Seeing the ‘TLND’ symbol flash across the ticker-tape filled me with a huge amount of pride, and took me back to the day when I took Business Objects public on the same market, 22 years ago. IPOs are often referred as an ‘exit’ and celebrated as the ‘end’ of a journey. But even though it is the culmination of the company’s existence as a private entity, an IPO is not the chequered flag after a race, it is rather the starting line of a marathon. Becoming a public company is a rite of passage from youth to adulthood. It is about entering a brand new phase in the company’s life. From the day to the next, it is suddenly thrust under a brighter and more intense spotlight than ever before. This most recent chapter in Talend’s story reminded me of my experience as a CEO of a public company for 12 years, and how much my work changed drastically from one day to the next; and how, in many ways, in spite of months of work to get there, I was vastly unprepared for it. This prompted me to write a letter to Mike Tuchen, Talend’s CEO, which you can find below. Congratulations for a great first day of trading today, and all you have done to get Talend on the path to be a public company. It is mesmerising to see your share price on the ticker for the first time, and it is easy to now want to check it every couple minutes. But the novelty wears off, especially when stakeholders in your company start using the constantly fluctuating number as a yardstick for your own performance as a CEO. It isn’t usually the board members who start to get jumpy about day-to-day rises and falls, as they’ve seen it all before. It is more likely members of your team and employees at large who will now keep checking the price movements. It would be wise for you to emphasize to the team that your share price may be a good indicator of company performance over the long term, but that is not a useful day to day barometer, as it can get blown about in the breeze. Things that have nothing to do with your company can nudge the share price up and down: market fluctuations, economic outlook, political instability, currency fluctuations, your rivals’ results… the list is endless. So, whereas it is of course exciting to see the stock price react nicely to positive news, watch out for any kind of celebration, or people will then anxiously expect your explanations when the stock goes the other way around. You should also make clear to your employees and managers that they should not expect major actions from you when the stock goes down. Everyone should continue to focus on the business. If the business performs, then the stock price will eventually reflect the success. By now, you must have recovered from the shock of the extent of disclosure of the IPO prospectus. Everything which was previously only discussed privately in closed door meetings has now been carefully detailed in this 200 page document. Not just financials, but every aspect of the business: the product, the customers, the risks associated with the business, all the way to management compensation. This level of transparency is your new ‘normal’. Things that used to be private conversations between the CEO, the CFO, and the board, are now matters of public record. Every quarter you will release earnings to Wall Street, so instead of an email and a private review session with your board, you will issue a detailed press release to the world, and ready yourself for a 2 hour call with dozens of well prepared analysts. The transcript of this call will be available to anyone who wants it. The performance of the company will be scrutinized in every conceivable way. Even the tone of your voice will be analysed. Private investors are used to results that are “not quite on budget”. Public investors, on the other hand, have little tolerance for a couple cents miss of the earnings per share. Poor results, or even good results but with a lowered guidance will send the stock tumbling down. It is often said that it takes 6 good quarters to recover fully from a bad one. The key lesson here is realistic caution. And straightforward communication. Give a conservative but realistic view of the business, and focus your investors, and the financial community, on the few key elements of the business which truly matter. Many private CEOs grow close to their private investors, who often become trusted mentors. I hope that we, as your venture backers, and board members of Talend for almost of decade, have provided some help along the way. However, over the next few years, most of us will move on to leave space to independent board members. They in turn will have the duty to represent the interests of shareholders at large, and to continue to exercise a proper governance for the company. At Business Objects, I had the chance to have a terrific board, which supported me, but challenged me in a constructive way. I have learned so much from them. I hope you will have the same luck. My advice to you is to spend the time needed to choose people with experience, who bring different kinds of expertise from various backgrounds, and who will know how to challenge and support you equally. Perhaps most importantly, pick people who will spend the time required to be helpful and engaged. You will also need to spend good time taking care of your public shareholders. They just entrusted you with close to $100 million. Building strong relationships with them and communicating openly and regularly will be key in ensuring their trust. I have found that going through the grilling questions of research analysts and shareholder technical teams can bring you great perspectives on what really matters to your business. As you now dive into the world of public companies, your job spec will change. You will manage less and lead more. As the company scales, you will progressively become a conductor, rather than a manager. This means that you will rely on your leadership team even more than before. Part of your role has been and continues to be to ‘surround yourself with people better than you’. Having that strong management team is critical to the success of a post-IPO company. In the past several years, I have been thoroughly impressed by how well you have done just that. You have built a fantastic team that will carry the company for a long time. Building and leading a highly functional team is the most rewarding experience of a CEO. Having complete trust, working in full cooperation, and being all aligned behind clear and coherent objectives, feels like magic. Don’t take that precious equilibrium for granted as it is your biggest asset. When you employ 500 people, employees fondly recall the time when there were only 100, when everyone knew each other, and when decisions could be made in minutes. When you have 2,000, people will reminisce about how good and cosy things were when you were ‘only’ 500. The IPO usually signals a new period of growth, so this will continue. On its own, and as it grows, the company will have a tendency to become slower, less agile, and less efficient. Decisions will start to become more opaque, and people may feel more distant from the top of the organization. You can change that. You can ensure that the company remains nimble, you can ensure that everyone feels informed, and empowered. But this will require effort, focus and time. Communicate even more than ever, ensure the organisation structure does not get in the way of people, build traditions and habits across the company, and stay close to the people, all the way across the organization. Becoming a public CEO is the most exciting adventure a person can have. It is one that of course comes with great responsibilities, but it is a thrilling journey. You have set the company on a terrific path. You have given it financial power and access to markets. You have given it a visibility that it never enjoyed before. You have given it a currency that will enable to acquire businesses if you so wished. Enjoy every moment of it. Congratulations for making the company part of this exclusive club, and good luck for the many years ahead.